I love getting my free Stylist magazine every Wednesday morning on the way to work. It’s like a regular ‘hump-day’ treat. I especially loved today’s issue which features a list of top ten movies that every girl (and some boys!) loves – whether they admit it or not. Inspired by the 25th anniversary of Dirty Dancing, Stylist looks back at other equally cheesy movies that we can’t get enough of. Grease is one of my all time favourites, the sing-a-long always puts me in a good mood. 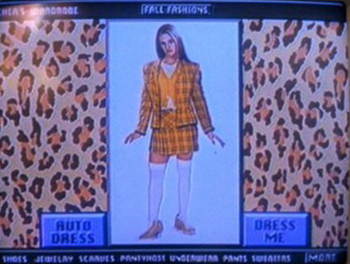 But what really brought it back was the mention of Clueless. As a nineties kid, I remember only too well the one-liners and catch phrases from that film, and hearing them repeated by my peers on a daily basis. *sings rollin’ with the homies*……..and remember those furry topped pencils we all had at school? ………and that Cher had her own wardrobe app before apps were even a thing!!! Like whatever – that is sooooo 1995! This entry was posted in Uncategorized and tagged 1995, cheesy, cher, clueless, dirty dancing, movies, nineties, nostalgic, oldies, stylist magazine. Bookmark the permalink. 1 Response to Like, totally clueless!